This report summarizes the proceedings of the international conference organized in Rome on 5 April 2017 by the Istituto Affari Internazionali, the Centre international de formation européenne (CIFE), the Austro-French Centre for Rapprochement in Europe (ÖFZ/CFA), in cooperation with the Italian Ministry of Foreign Affairs and International Cooperation. 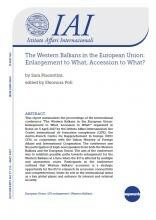 The conference saw the participation of high-level speakers from both the Western Balkans and the European Union. The aim of the conference was to establish possible paths towards enlargement for the Western Balkans at a time when the EU is affected by multiple and asymmetric crises. Participants in the conference outlined that Western Balkans’ accession is a strategic opportunity for the EU to relaunch its economic connectivity and competitiveness, foster its role in the international arena as a key global player and enhance its internal and external security.